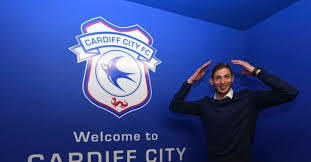 January 30 – The family of missing Cardiff City forward Emiliano Sala have hired a private company, paid for by fundraisers, to carry on looking for the 28-year-old after rescue workers finally called off the official search last week for the light aircraft that was carrying him to his new club but disappeared off the English Channel Island of Guernsey. Guernsey authorities said that the chances Sala and his pilot David Ibbotson had survived were “extremely remote”. But, after a plea from his sister not to give up, more than £290,000 was raised for a private search. David Mearns, a specialist in finding shipwrecks, said that if the plane’s wreckage was located, the next step would be to try to recover it. He said Sala’s family was determined to establish what happened. Cardiff’s game at Arsenal on Tuesday would likely have been Sala’s first since the club record deal for the former Nantes forward was signed less than a fortnight ago. Visiting Cardiff fans paraded Argentine and Nantes flags as well as their own and one banner read: ‘We never saw you play and never saw you score but Emiliano our beautiful Bluebird (Cardiff’s nickname) we will love you forever’.